ABC news crews spent an unprecendented three months at Johns Hopkins Hosptial this fall, filming a six-week series. Total access, it turns out, can be a very complicated matter. One of the toughest experiences a doctor or nurse will ever face: watching a child die. One of the toughest questions a journalist will ever ask: When to turn the camera off? ABC producers Raney Aronson and Charlie Poe just happened to be in the Pediatric Intensive Care Unit (PICU) one afternoon in November, checking in during their daily coverage of the pediatrics beat at the Johns Hopkins Children's Center. They and other ABC News crews were wandering the floors of the Johns Hopkins Medical Institutions for an unprecedented three months in the fall. Sixteen producers outfitted with Sony Mini DV camcorders had nearly total access to the hospital's inner life. The TV network was gathering material for a six-week prime-time series on Hopkins: a model teaching hospital. Cognizant of the risk of letting reporters wander, Hopkins hopes the series will reveal the hurdles teaching hospitals face, including the sometimes throttling presence of managed care. ABC's program will likely be aired this spring--one hour per week, a continuing saga of Hopkins patients, doctors, security guards, and the lady behind the flower counter. But what does total access mean to a hospital accustomed to working within a realm of privacy, and a crew of journalists intent on exposing the "closed culture of medicine"? It's Monday and Aronson and Poe are in PICU to interview the family of a 17-year-old with leukemia when they run across the parents of a baby who survived heart surgery days after birth. They had taped the infant and his family weeks before: a surgical success story. The baby was brought to Hopkins earlier that day for outpatient treatment. He was fine that morning, playing with his brother. He seemed to have the sniffles. Then he threw up in the car on the way in, PICU staffers say. The child ends up in intensive care, his stroller rolled into a corner. His heart has stopped. Doctors are performing CPR. Poe, in a yellow paper gown and a blue face mask, jumps into the room and begins taping doctors and nurses at work. Pediatric staffers run in and out of the open door, carrying syringes filled with Epinephrin and other drugs they hope will get the baby's heart started and stable. Other hospital staff in white lab coats and stethoscopes line the room to watch, arms tight across their chests. Though they already have the family's signed consent to tape, Poe and Aronson decide to ask anyway if they can keep shooting. The door to a side conference room is propped open. The parents, who are waiting for news inside, shake their heads no. Just getting a consent form isn't always enough. Producers like Charlie Poe (above) must balance their need to get the story with their need to be respectful of patients. Aronson signals Poe and he walks out, pulling off the gown and mask. Doctors work hard to revive the baby's heart--there's a breathing tube, a ventilator, pressure on the child's chest and medications. Minutes weigh heavily, since reduced oxygen to his brain can cause irreversible damage. At one point, the father steps into the hallway to get a cup of coffee, giving the TV crew a hopeful half smile on his way back into the tiny waiting room. For a half hour, Aronson and Poe watch, involved but not involved, fretting over what they should do to document the story without adding to the parents' grief. Poe repeatedly brushes strands of hair from his forehead. Everyone in the unit is upset. "He was doing OK," Aronson says about the baby. "He just came in here for outpatient treatment . . ." Her eyes tear up. She goes into a nurses' station to collect herself: "I'm not supposed to get attached." Poe, 32, and Aronson, 29, had spent the previous month in PICU, from 7 a.m. to 7 p.m. daily getting to know the doctors, nurses, and patients. 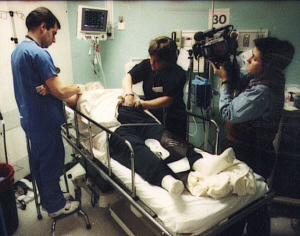 That much time spent on just one element of a medical story is unusual for TV news crews, which often rely on choreographed shots of doctors providing treatment, patients being wheeled down hospital corridors, or experts being interviewed in their diploma-lined offices. Instead, these field producers are finding stories by covering reporting beats: neurology, OB-GYN and neonatal, oncology, the Wilmer Eye Institute, pediatrics, the medical school, psychiatry, and other elements of life on the East Baltimore campus. Like the other producers, Poe and Aronson are documentarians. Using the small, less intrusive video cameras (there are no big lights or microphones), they hope to show--via on-camera interviews, voice-overs and cinéma v&eacteu;rit&eacteu; taping--what really happens in pediatric intensive care, and elsewhere. And it's not all success stories. While Hopkins doctors and nurses work to save this baby's life, Poe and Aronson go back and forth over how to tell this tale, if there is one to tell. Possible story lines: the painful stories of PICU. Or, what are the dangers faced by babies who undergo early heart surgery? "Can I shoot in the doorway?" Poe asks Aronson, tilting his head toward the activity moving in and out of the baby's room. "I think it's okay," she replies. "What if the parents come out and see me shooting?" he asks. "No, you can't then," she says. "We need to be respectful," says Aronson, a slight woman in stylish black pants and a black sweater. "I wouldn't want a camera in my face if my child was dying. Not in a million years." She reflects. The baby was born with a malformed heart--instead of an aorta and pulmonary artery he had one common blood vessel. There were various surgeries. "We covered the baby a month ago. We were there for a leg graft operation. We did our little story and that was great. We said goodbye. Then we walk in here and this is going on." A frustrated Poe is holding a dormant camera. "This is the worst part of our job," Poe says. "The unfair truth is you don't see something if it's not on tape. It's much harder to tell a story." The doctors and nurses start to file out of the baby's room, pulling off their gloves. Their faces are tight and pale. There is no dramatic ending, no flat line, no made-for-TV, ER-style cries of anguish from the professional staff. Several doctors walk into the waiting room to tell the parents their baby is dead. Back in the nurses' station, the two journalists review the drama they inadvertently had witnessed. And they start to think: What if the parents change their minds and want their child's story to be told? Poe paces. Did he capture enough on tape when they first arrived? He and Aronson review the mini-tape on the palm-sized screen that flips up from the side of the video camera. The footage shows close-ups of doctors wearing masks and the baby with tubes attached to his body. Two nurses in the station turn to stare hard at the producers. One is microwaving dinner and brusquely leaves. Aronson notes their disapproval, and she and Poe turn off the tape. Another nurse from the unit walks in. "Are you okay?" Aronson asks her. "Are you guys okay?" responds E. Amy Hong, R.N. A clearly shaken Poe goes to get coffee from a machine nearby. His shirt sleeves are rolled up. "Whoa!" he cries out. The machine has started, but he has forgotten to put a cup underneath. "That's the second time I did that." As the nurses leave, the news team debates whether they should have shot more, or been following the child more closely after the leg graft operation. "Little did we know," Aronson says. "Little could we know," Poe says. "We didn't miss the story," Aronson says firmly. "We got the story and we stopped when they said to. Now we can wrap around that and come back to it later. We have to be creative." Aronson notes that just getting a consent form isn't enough. Access and permission and carte blanche are nice, but in the end, you are dealing with humans. "In a hospital situation, you are given access, but we need to make sure we are not crossing any boundaries. You constantly have to negotiate. "And we keep coming back here," she adds, referring to the hospital. "It's not like we shoot and then leave. We have to face them the next day." 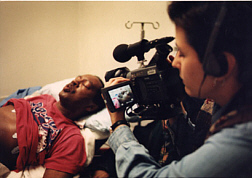 Equipped with their Mini DV camcorders, producers had nearly total access to the hospital's inner life. 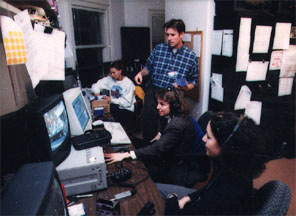 It was early June 1999, when ABC Field Producer Severn Sandt picked up the phone in her New York office to call academic medical centers across the country. Her mission: propose a never-before-done prime-time series. ABC wanted three months of round-the-clock access to a university hospital. That meant teams of producers wandering around in emergency rooms, poking into nurses' stations and stepping into oncology clinics with cameras and questions. Some medical centers would say no thanks. The first call was to Hopkins. Sandt's ABC colleagues told her to forget it. "There was this sense at ABC that [Hopkins] would never tolerate that access, but I said they are really one of the best, we should explore the possibility," she says. "When I made the call, I was thinking, 'This is going to ruin my day.'" Joann Rodgers, deputy director of the hospital's public affairs office, answered the phone and heard Sandt out. She was contemplative. This is an interesting idea, Rodgers would say, but it would be important to maintain patient privacy. Sandt scribbled snippets of the conversation in the opening page of a new notebook. Rodgers agreed to run the concept by her bosses, and Sandt wrote down Rodgers's e-mail address. That page--the first in what had grown into three bound notebooks by the fall--became a talisman taped to the white wall in front of Sandt's desk at the ABC office set up in the hospital. For a bunch of oft-cynical journalists, this group is positively jazzed. "Hopkins has opened its doors and it is extraordinary," Sandt says. "It requires a huge amount of trust, a leap of faith." The project is also a huge commitment on ABC News' part. There are numerous production costs (the network has even rented downtown Baltimore apartments to house field producers and allotted a per diem for their food). Despite the relatively low-budget use of small DV cams, the overall cost is in the millions--an estimated $300,000 to $400,000 per one-hour episode. As one producer jokes, "Let's say it's cheaper than six episodes of NYPD Blue." Network support comes from the top. The idea was the brainchild of ABC News Vice President Phyllis McGrady. While working overseas in the early '90s, McGrady watched a popular Australian reality-based show set in a hospital. After she came home, she spent weeks in hospital settings when her mother and boyfriend both faced major surgeries. "I saw there was a sort of interesting culture in the hospital that you never capture when doing a medical story," says McGrady, also an executive producer. "There is a family sense." What ABC hopes to do, McGrady and the other producers say, is take viewers to a place they can't go themselves, and to tell the true story of a teaching and research hospital--the exploration of new treatments, the patients who agree to participate in experimental protocols, and the challenges faced by interns and their mentors. ABC hopes the images and story lines will carry the messages, instead of the typical narrator-laden, essay-style programs seen weekly on 20-20 or Dateline NBC. Other series, such as Trauma--Life in the ER, use the reality-based concept, but ABC is taking the approach further. "We won't be saying, 'A chief problem is the shortage of nurses,'" Sandt says. "People aren't stupid. They don't have to be spoonfed." Before selecting Hopkins, ABC talked to other top academic hospitals, including Stanford University Medical Center and Massachusetts General Hospital. Sandt says she discovered common themes, especially about how managed care is changing the way a research hospital works. In late June, ABC News made a site visit to Hopkins. Rodgers and others already had envisioned what could be accomplished through this series. "I presented this to our top leadership: It is a risky venture. But one in which the risk will be able to be managed to some degree, and is worth trying to manage," she remembers. Images and story lines, rather than narration, will propel the six-hour series. Says coordinating producer Severn Sandt (seated, middle), "People aren't stupid. They don't have to be spoonfed." "To the degree that academic medical centers need to be appreciated for our value, we need to show what we do," Rodgers says. "We whine about the lack of congressional funding, that managed care is killing us, that there aren't enough resources. Yet we're the jewels in the crown of the health care system. "Now, our leadership has said we have the opportunity to be statesmen. If Hopkins can't take the risk, which [academic center] can? Hopkins is at the top of its game." As many as 10 to 15 million viewers may tune in. It is, as Rodgers notes, "a chance we won't get again." That practical, thoughtful approach is what ABC was hoping for. The risks, of course, are that ABC--like some media in the past-- will expose an embarrassing fact, treat an issue in a shallow or out-of-context manner, or otherwise make the university look bad. The two sides also worked through the issue of patient privacy; lawyers talked back and forth. Consent forms were drawn up. ABC crews underwent criminal background checks, because some would work with children. And they got flu shots. Both sides made promises. Patients would be told about the ABC project by doctors, nurses, or the producers themselves. Patients would need to agree to be taped by signing a formal ABC-Hopkins consent form. If, in an emergency or similar situation, a patient was taped, they could say yea or nay afterward. Hospital staff, who didn't need to provide consent, were nonetheless given the option to bow out. Hopkins' doctors, nurses, and other staff, after meeting with administrators, agreed to cooperate with the project. Doctors, especially, would make suggestions about research or cases that might make good stories. Notice was given via internal memos and posted cards. Yet when it came down to the university's concerns about media distortion, ABC could make no absolute promise. No Hopkins representative is viewing the final product before it airs. The network's best defense: Six hours of prime time. "Six hours provides context," says Peter Bull, a longtime producer on the project who has worked on numerous documentaries, including PBS's medical series The Mind and The Brain. "If, in a one-hour program, a surgeon slips up and the patient dies, that is the most dramatic moment. That's all people take home: The lesson that the doctor screwed up. But if it's one little mistake in the context of six hours, the story assumes a whole different dimension." Evaluating imperfection, the producers say, is one way to deflate a burdensome myth of perfection. "How does Hopkins deal with things when they go wrong?" poses ABC producer Terence Wrong, a fellow documentarian on the project who has produced high-profile episodes of ABC's Century Project. "One thing I'm confident of is that if something does go wrong here, it won't be swept under the rug," he says of Hopkins's general review processes. "There are committee meetings and committee meetings ad nauseam to find out what went wrong. That's why we want to see the M&M's. To get this self-correction in action." The crews did get unheard-of access, including taping during a few of the Morbidity and Mortality conferences in which doctors frankly analyze unsuccessful cases to improve future care. Mostly, the journalists established relationships with patients and doctors they would feature. Joanne Natale, an attending physician in PICU, worked with Poe and Aronson. "They were very considerate of the patients and staff. They were great." But some hospital staff still grumbled or expressed fears. Many are camera-shy, and some patients changed their minds about being on TV after giving consent. ABC agreed not to use such footage. Occasionally crews would get dirty looks or hear heavy sighs when hospital staffers were asked to leave their lunch room so ABC could shoot video of a doctor looking at MRI results. Some family members got upset when they saw camera crews following a patient, and they hadn't yet been informed. Rodgers had expected some conflicts: ABC has "to overcome the built-in skepticism that people have in the institution with respect to television. No matter how unobtrusive they are trying to make it, it is still intrusive. People worry when they are being taped." One patient in Oncology says he didn't mind working with an ABC producer, yet--despite Hopkins's and ABC's care in informing patients of their choice--his personal interpretation was different. He recalls his doctor asking him whether he would mind if ABC News questioned him for an upcoming special on medicine, and says, "The doctor is about to administer this protocol that could save my life, what am I supposed to do? Tell the doctor no?" Other patients welcomed the attention. Jeffrey Schmidt is fighting renal cell carcinoma, a cancer that has spread to his lungs and brain. ABC producer Bill Day spends a lot of time with Schmidt and his family. He knows that they play canasta to pass the time; that Jeff's wife, Doreen, is the best nurse a husband could ask for; that his seizures have gotten bad; and that the colored dye that's used in a body CT scan creates a warm sensation ("And it's not a peppermint patty," Schmidt jokes to Day). A scene with Day and Schmidt, outside Radiology. Day turns on the mini-cam. Schmidt sits quietly in the wheelchair, wearing a thin hospital gown, open in the back. Schmidt learned several months before that he has cancer, when he finally checked out a chronic cough. As he sits alone in the corridor, he stares straight ahead. Day says something to ease the empty space: "More waiting." Schmidt responds, half smiling: "You get used to it after a while." "These guys are great," Schmidt says of Day and his fellow producer, Andy Paterson. "To me that makes a big difference. At first I didn't want to do it, but I talked to my wife about it and she thought it might bring more attention to us, it might help us. And it could help Johns Hopkins. What I have is a rare disease, maybe this will help someone." Day and the other producers deal daily with an inherent journalistic dilemma--creating intimacy to gain trust while still acting as objective observers. Sometimes all involved become friends. As the weeks went on, other patients became comfortable with the project. Wrong boasts an 85 percent patient consent rate. But the crews also found that Hopkins culture isn't always so easy to break into. When ABC first arrived, word hadn't gotten around to the nurses, who started blocking crews. Producers Raney Aronsen and Charlies Poe on the pediatrics beat. "Nurses are the guardians of the patients," Sandt says. "They are hardwired not to talk about patients. And with camera crews around, it just went against their grain. But now that we've had the chance to tell them what is going on, they are our best allies. They beep us when things are going on." The question of "access" also is a bemusing concept when dealing with Hopkins doctors. Aronson and Poe worked every angle to get Ben Carson, the ultrabusy director of Pediatric Neurosurgery, to sit down in front of the camera. They wheedled Carson's colleagues to beep them if they stepped into Carson's office. They even trailed Carson at speeches to get footage of the famous brain surgeon. Poe, Wrong, and the project's director of photography, Richard Chisolm, finally got Carson to speak on camera in late November. The cramped ABC control room, on fourth floor Billings, is run like a foreign news bureau. Says producer Terry Wrong (left, center), "It's a hectic atmosphere." Another ABC team, Michelle Smawley and Kat Patterson, were eating bag lunches at 3 p.m. after hectic attempts to keep pace with Dr. Frederick Montz in Gynecology and other surgeons who manage crowded clinical and travel calendars. Smawley, in scrubs after surgery one afternoon, says "The toughest thing is keeping up with doctors' schedules. They'll have three surgeries back to back and don't have time for lunch. These guys, these gals, have extraordinary lives. It's go, go. From surgery to clinic..."
"To Arizona to Argentina," her partner Patterson picks up the refrain. "To surgery to clinic to surgery," Smawley says, and they both laugh. Shelves are lined with rows of videotapes labeled with small colored dots. 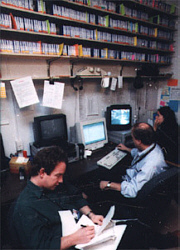 The day's footage can be viewed on a handful of video monitors, and one screen is covered with a piece of paper, "Broken Computer # 2." By the window is a cardboard box labeled DEAD BATTERIES, to recycle. It's overflowing. To cover all the stories ABC hopes to show, producers will edit 1,500 to 2,000 tapes during the heart of winter, at what Sandt calls "an undisclosed location." Several times a day, producers check in to tell Sandt, the coordinating producer, what they're working on. Sandt, a small-boned woman, is a taskmaster with the phone and message pagers. And why not? If she is willing to eat late lunches out of an industrial-sized box of raisin bran. Sometimes, she even takes out the trash at the end of the day. Producer Wrong, who has worked in Beirut, Jerusalem, Frankfurt, and London, makes the comparison between the ABC office at Hopkins and the foreign bureau scene: "It's like going into a place and not knowing the story, and then reporting your way out of obscurity," he says. "Crews are dispatched every day. We can't predict at the beginning of the day what we'll get at the end of the day. It's the evolving story of patient care, and it's a hectic atmosphere." Until they begin to edit, Bull and Wrong aren't sure just how the stories will be told, whether they'll devote one episode to a child who suffers from seizures or tell his tale throughout the six weeks. Voice-overs of patients and doctors taped during interviews will accompany footage of them in the hospital. A narrator, maybe Peter Jennings, will fill in gaps to bring viewers up to speed. By the time filming finished there were 1,500 to 2,000 tapes to edit. And, even with the unusual gift of six hours of prime time, the ABC producers will struggle with the ambitious nature of this project: How to capture the story of an entire hospital, and visually depict such abstract concepts as the hospital's struggle with managed care. Sandt describes one way to touch that issue. "If a doctor wants to perform a certain kind of treatment, and an insurance company won't pay for it, we film him arguing on the telephone." Such frustration over managed care is everywhere. Moment 1--In Carson's mentoring speech to local schoolchildren in Turner Auditorium, he encourages the youths to go into medicine. But his touting of a doctor's life contains a sardonic aside: "There's steady work," Carson says, "at least we had that before managed care." Moment 2--A medical intern goes to discharge a patient for a surgical procedure that in the past would have kept him in the hospital for days. He's out in hours. The patient is perplexed by the cutbacks. "I pay $1,702 [in insurance premiums]," he says. "Everything is helter-skelter." Moment 3--A woman who has an eating disorder is admitted to Psychiatry. She is starving to death. After two weeks of treatment, her insurance denies coverage. Doctors worry that she is in danger. The family opts to go in debt and pay the $1,000-a-day treatment cost. As the spring airing date for ABC's series draws near, it remains to be seen how the network's take on Hopkins will be played out. As Wrong points out, "We are winging it." As Bull asks, "Are we getting what we need?" As Hopkins's Rodgers notes, "It's an incredible opportunity. We are keeping our fingers crossed." On a Monday in November, back in the ABC News office, Charlie Poe has some news. The parents of the infant who died say they would like their story to be told. Maybe what happened to their baby could inform other families and prevent other deaths. Poe is still kicking himself about not having shot more. But as the weeks go on, the baby's story is overwhelmed by all the others at the hospital. It might not make the final cut. Either way, Aronson's words about their decision to turn the camera off quietly echos. "We had no choice." Poe's as well: "In the end, it's just a TV show." The ABC News series will likely air in the spring. For more information, visit the network's website: abcnews.go.com, or check local listings.